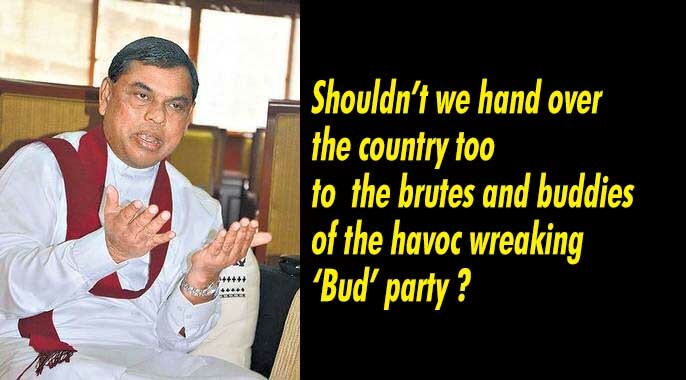 LEN - www.lankaenews.com | Shouldn’t we hand over the country too to the brutes and buddies of the havoc wreaking ‘Bud’ party ? (Lanka e News -10.Aug.2018, 11.30PM) Basil Rajapakse the founder and competent authority of Lotus Bud party, while addressing the members of the ‘Bud’ party who captured power in the villages , recently said in Galle , ‘ an individual may be eating chocolate in the vicinity of a sekkuwa (extractor of oil) but the on looker may think he is eating poonac’. While saying this , he issued a warning to the members that the people could accuse the one who goes into a funeral house to play cards also as engaging in illicit gambling while adding jocularly some of course really indulge in it . Basil’s apprehensions were confirmed when a pradeshiya sabha member of his was apprehended by the police for a bigger crime even than gambling - running a gambling center secretly inside a restaurant. On August 1 st night the Dompe police conducted a raid and took into custody 17 suspects along with equipment and items used for gambling activities from an illegal gambling den run most secretly within a restaurant in Dompe town . This restaurant to the dismay of all belonged to a newly appointed pradeshiya sabha member of Podujana Peramuna alias ‘Lotus Bud’, and the raid was conducted under the supervision of senior S.P. Gampaha , Muditha Pussella. Rowdies and Buddies of the Bud of notorious Basil in a free- for- all at Mihintale ! Meanwhile to what lowliest level Basil’s bud party and buddies can stoop was well and truly demonstrated at Mihintale pradeshiya sabha as recently as on the 8 th. During the development activities , Bud party ‘s member of Mihintale Ruwangama division alleged that the Bud party’s member of Mihintale , Namalwewa division had been granted special privileges , and abused in filth while trying to assault him, when the entire Mihintale pradeshiya sabha turned into a battle field . The dispute arose over the installation of streets light in Namalwewa belonging to Mihintale pradeshiya sabha . Nipuna Madusanka of the Ruwangama division abused Chaminda Sampath Dissanayake of Namalwewa division in foul language and questioned ‘how come only you are lavished with all the privileges ?’ while also attempting to deal physical blows when Chaminda too scolded him back in unalloyed filthy language ( the only language Basil and his buddies of the Bud party know !) and tried to assault Nipuna . At that juncture , pandemonium broke out . 8th being the public day , when the Lotus Bud party members exchanged loud unpardonable unbearable filthy abuse and behaved violently ,it was naturally most bitterly resented by the people who had gathered there.. The unruly uncouth Buddies of ‘Bud’ party who captured power in villages now seek full power over country in most crude obnoxious fashion! The mayor of Maharagama, a buddy of Bud party within a week of his appointment demanded that he shall be addressed as ‘Sir’ . Another buddy of Bud party was caught red handed in Dompe running a gambling den illicitly . At Mihintale , yet another group of buddies of the Bud party who were at each other’s throat shamelessly abused one another loudly in the choicest language at Mihintale . In the circumstances why not we give a try handing over the entire country too to these rowdies and buddies of the ‘Bud’ party of Basil the fraud ?